Hi there, I made this little card to enter in the challenge at Mojo Monday. 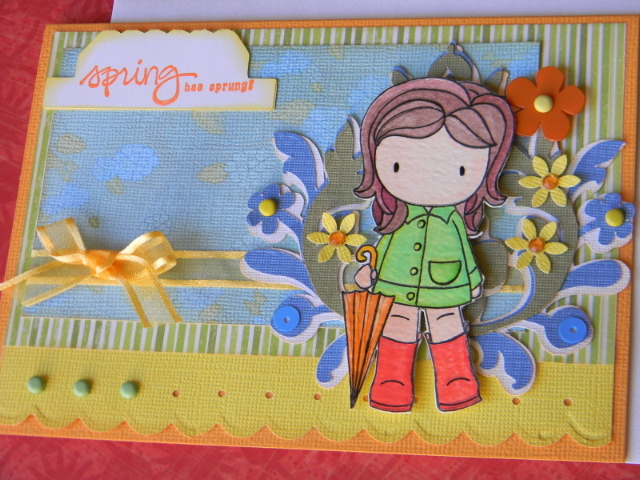 I used a stamp I won from Kimberly Trevino and papers from American Crafts (awesome cardstock!!!) as well as papers from my stash and a Martha Stewart punch for the scallop edge. 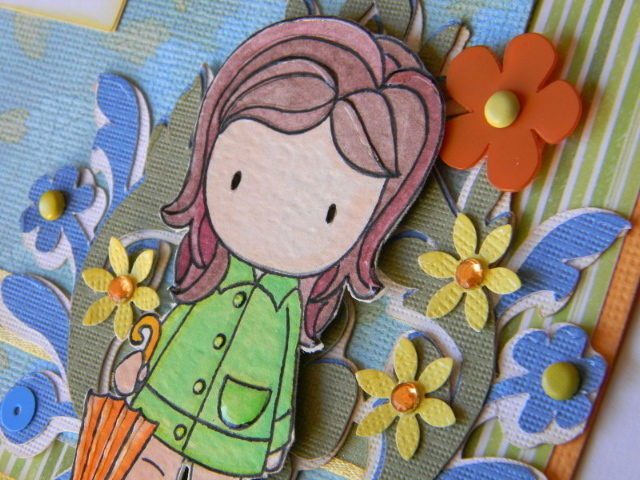 The diecut behind the little girl is from Cricut's Mother's Day 2010, and the stamp is from Sugarplums. Her name is Rainy Day Emma. I added glossy accents to give her some "dew" left from the rain. She has sunnier days ahead!! TFL! Tab is from From My Kitchen, MS Border Punch, Fleur de Lis from Mother's Day 2010, mini flowers from Fiskars punch. I love her kickin' red boots!! The orange flower is from American Crafts, as well as the ribbon & Cardstock. I colored her with watercolors & added Glossy Accents. Oh, how fun is that! Love all those flowers. Too cute! Thanks for playing Mojo Monday!